Your kid has always been a fan of anything even remotely scary. So, you knew when he discovered zombies you were going to be in for a fright. He loves to hide behind doors, and jump out at you. He loves putting fake spiders in weird places. So, you know he will want to be one of the dead who walk among us. He will get bitten by the zombie bug. He will study the way zombies walk. The slight drag of the left foot. Arms held out in front, reaching for the squishy pink brains of anyone nearby. He will practice the grunts, and moans of the undead creatures. Waiting for his turn to be one of them. His turn to taste gummy brains. This skeleton zombie costume comes with a top, pants, mask, and a pair of gloves. The shirt and pants both features attached foam sections with skeletal details. It also gets a lot of its scare factor from the latex skeleton mask with mesh over the eyes. Skeleton gloves are the finishing touch. This classic costume is sure to let any kiddo become just the kind of creepy character they'd like to be this Halloween! So, this Halloween let him embrace his scary side. 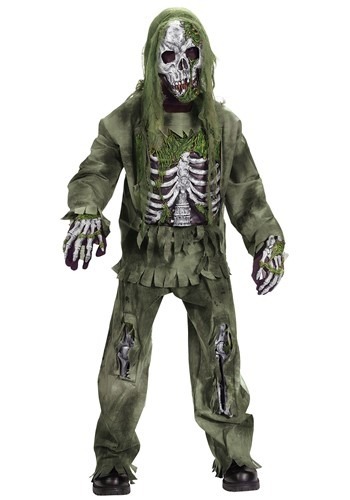 Give him this Kids Skeleton Zombie Costume so that he can join the legions of the undead. He will be impressed by the frightful decaying bones, ready to go scare all your neighbors into giving him chocolate. His candy bag held in one of his outstretched hands. Walking with the perfect limp, the one he practiced all month. And if you are feeling in the mood you can even make him a strawberry-kiwi JELL-O brain. A little treat for your zombie to sink his little teeth into. Great! but size is waaaay off. My son is 46" tall, will be 6 in one month, and weighs 50lbs. the XS (3T-4T) fits him perfectly. the pants are not as long as in the pic shown on this website, but the fringe still has a "fall" on top of the shoe.